Imagine om-ing to 'Hotline Bling.' YAS. With the growing number of yoga-infused alternative workouts spreading in the fitness community, we knew it wouldn’t take long until something like this came along. 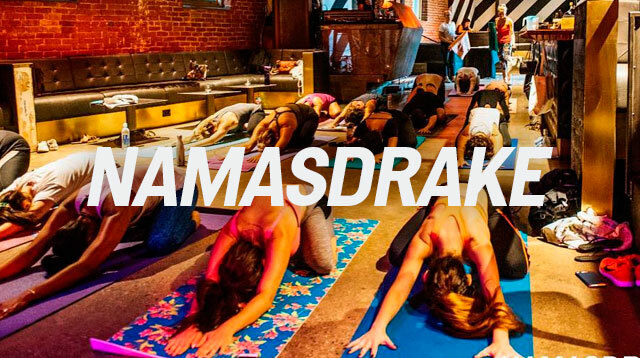 DJ/event promoter T.J. Petracca collaborated with DJ/yoga instructor Paul Schneider to come up with Namasdrake, an hour-long Vinyasa flow class set to an all-Drake playlist. The monthly classes began in July and are held at Resident, a hybrid bar, beer garden, and nightclub in Los Angeles, California. According to LA Times writer Agatha French who tried Namasdrake in August, a single class costs $23, and you have to bring your own yoga mat, towel, and ID (you have to be at least 21 to enter the bar). The poses are challenging, strength-based, and intensifies with the music, ranging from high-energy Drake beats such as “One Dance” to more mellow hits like “Hotline Bling.” The music is spun live from the DJ booth. But Namasdrake isn’t the first hip-hop yoga class in the US. According to Yoganonymous, New York’s Y7 Studio has been offering upbeat yoga classes since 2013. Their musical themes include Beyoncé, Rihanna, and Kanye West. In Chicago’s Yogaview Studio, there’s a Led Zeppelin-themed yoga class. In Manila, we have yet to hear of a club-run or hip-hop-infused yoga class, but we have attended classes where teachers opt for more modern hits instead of the usual spa music as soundtrack. A Broadway-themed yoga class in the near future, perhaps? Count us in!